Wedding trousseau selected, booked the reception venue and the guest list plus gifts are ready – now you are perplexed as to where to go for your special vacation – your once in a lifetime honeymoon. After all, it's the most important trip with the man of your dreams. You must have dreamt of going to one of the most exotic honeymoon destinations, but your wedding turns out to be excessively expensive. Fret not ‘coz a budget honeymoon is here to save you from months of debt. Walk along the sun-kissed beaches of Goa or go skiing in Shimla…there's so much to view at these exotic places that you wouldn't feel like going anywhere abroad. Pay a glance at the budget tips for a memorable honeymoon. Goa: Goa since ever has been the hot favourite destination of all honeymoon couples. The white sands, setting sun, gleaming blue water are expert to create that romantic halo. And why not? Goa is even cheaper as compared to fancy properties in Rajasthan and Kerala. Some of the very less crowded beaches for honeymooners are Morjim in the north, and Cavelossim and Palolim in the south; holding your man's hand and getting cozy to him on these beaches is a fabulous idea as privacy is the key to happiness on your honeymoon. Tip: You can hire cheap bikes and cycles to go around Goa as they are pretty affordable and give you the joy of life.Go shopping at umpteen flea markets, wear exotic Goa costumes – the sarongs, wrap-arounds etc. And the best way to save money is to stay at the less touristy places like the beaches mentioned above. 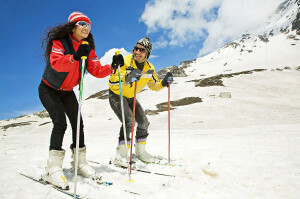 Shimla: You have always seen one of your relatives dressed in those authentic Shimla women costumes in various poses to recall their wintery memories in the most celebrated hill station in India.Over the years, Shimla has come to be known as a popular honeymoon destination in India mainly because of its development, its awesome scenic beauty, Kufri – a secluded part of Shimla and the soothing weather throughout. Thanks to some quaint home-stays (they are truly affordable in every sense) the hill station has to offer; you can enjoy your best moments with each other dwelling in the lap of the snow capped Himalayas. Tip: Choose to stay in a home-stay rather than a hotel because on your honeymoon the last thing you want to do is find eateries where you get hygienic food. You will surely enjoy the quiet ambience of these home-stays and love to enjoy your privacy at its best. Kerala: Popular for its luxurious retreats, Kerala is one destination where people aren't aware about the popular B&B hotels as well as affordable home-stays which provide good privacy. You have the choice to opt for the romantic backwaters in Kumarakom, or head to the serene hills in Munnar that offer beautiful scenes all around that make you drool over! A smart way to do Kerala on a budget on your honeymoon is by choosing the best of both worlds and visiting both for little time and trust me it is totally worth it. Tip: By avoiding the stay for a night in a house boat you can easily make plan for a day's trip instead. It is cheaper but only if you are talented enough to bargain. Envious Of Your Facebook Friends? No Need To Be!